The Routledge Intermediate Turkish Reader has been specially designed for intermediate and advanced learners of Turkish and comprises a broad selection of graded readings. Written by prominent Turkish academics and journalists, the collection of modern texts presented here have been carefully selected to ensure students receive maximum exposure to current political and cultural issues related to Turkey; from gender, ethnicity, religion and social class through to arts and history. a list of suggested further reading (online support). 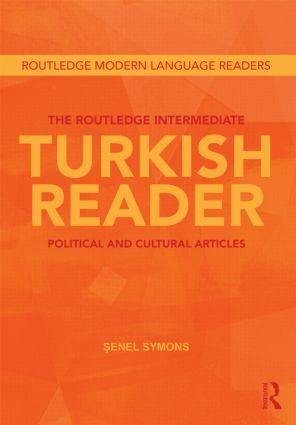 Suitable for both class use and independent study, The Routledge Intermediate Turkish Reader is an essential tool for increasing language proficiency and enriching the learners’ socio-cultural knowledge of Turkey. Introductions in English by: Prof. Dr. E. Fuat Keyman, Koç University, Prof. Dr. Ümit Cizre, Bilkent University, Dr. Can Dündar, journalist, writer, columnist, director, Dr. Martin Stokes, Oxford University, Prof. Dr. Cemil Koçak, Sabancı University, Prof. Dr. Fatih Selami Mahmutoğlu, İstanbul University, Prof. Dr. Fatma Gök, Boğaziçi University, Prof. Dr. Dilek Cindoğlu, Bilkent University, Prof. Dr. Yıldız Silier, Boğaziçi University, Prof. Dr. Ayşegül Kibaroğlu, Middle East Technical University, Prof. Dr. Oya Pancaroğlu, Boğaziçi University, Prof. Dr. Meliz Ergin, Koç University, Prof. Dr. Özlem Tür, Middle East Technical University, Prof. Dr. Ayşe Uyduranoğlu, Bilgi University, Prof. Dr. Zeynep Gambetti, Boğaziçi University, Prof. Dr. Saime Özçürümez, Bilkent University, Prof. Dr. Kürşad Ertuğrul, Middle East Technical University, Dr. Selin Akyüz-Şaşmaz, Bilkent University. The articles in Turkish by: Prof. Dr. Murat Belge, Bilgi University, Prof. Dr. Orhan Tekelioğlu, Bahçeşehir University, Prof. Dr. E. Fuat Keyman, Koç University, Murat Yetkin, journalist, columnist, lecturer, Radikal, Prof. Dr. Türker Alkan, Çankaya University, Prof. Dr. Baskın Oran, Ankara University, Prof. Dr. Hakan Hakeri,Ondokuz Mayıs University; Cem Erciyes, journalist, Radikal, Dr. Fikret Bila, journalist, columnist, Milliyet, Prof. Dr. Şahin Alpay, Bahçeşehir University, Prof. Dr. Mümtaz‘er Türköne, Gazi University, Prof. Dr. Mahnaz Gümrükçüoğlu, Sakarya University, Dr. Ali Bayramoğlu, journalist, Yeni Şafak, Prof. Dr. Hakkı Uyar, Dokuz Eylül University, Ayşe Hür, historian, journalist, columnist, Taraf. Senel Symons is a specialist on sociolinguistics and has been teaching Turkish at the University of Oxford, UK, since 2004. Routledge Modern Language Readers provide the intermediate language learner with a selection of readings which give a broad representation of modern writing in the target language. Each reader contains approximately 20 readings graded in order of difficulty to allow the learner to grow with the book and to acquire the necessary skills to continue reading independently. Suitable for both class use and independent study, Routledge Modern Language Readers are an essential tool for increasing language proficiency and reading comprehension skills.